This is how mountains are made. I wake up with this sentence in my head. Thus and only thus the mountains are made. Someone pokes me in the corner of my mouth. What the hell. There is someone poking me. Wait! I open my eyes. It’s a small boy. Bloody hell. ​Bloody nonsense this is. Who is he, this lad? Once again he pokes my cheek. 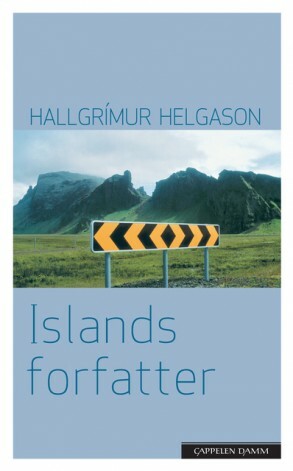 Helgason’s biggest and most ambitious novel, Höfundur Íslands (The Author of Iceland) was a succès de scandale, since the main character was based on the famous Icelandic writer, Halldór Laxness (1902-1998), who received the Nobel prize in 1955. The novel tells the story of a very old and famous Icelandic writer who has died and who, after his death, wakes up inside a novel he wrote some fifty years earlier. Thus the author lives on in his work. The main character, Einar J. Grímsson, is partly based on Laxness, and the novel he’s trapped in is inspired by Laxness’s biggest novel, Independent People. The publication of “The Author of Iceland” caused outrage among the old leftist elite in Iceland who felt it was sacrilege to write about Laxness, especially his communist past. For this novel Helgason received the Icelandic Literary Prize in 2001. The German translator, Karl-Ludwig Wetzig, received the Dialog-Werkstatt Zug prize for his translation. Published in German, Danish, Norwegian, Finnish and Italian.